ATLANTA, GA (April 23, 2018) – iMackulate Vision Gaming (iMackulate or “IMV”), is excited to announce that plans are underway towards “Gridiron Champions,” a college football video game which anticipates filling the void in today’s marketplace with an expected launch date of 2020 which gamers will be able to purchase and use via digital download through services like the PlayStation, Xbox and Steam on-line stores priced at $59.99. Gridiron Champions will offer a unique experience to gamers by allowing them the opportunity to customize player uniforms, stadiums, fan atmosphere and recreate pageantry though this unique college football experience. “There is no college football game on the market that offers a creative experience like Gridiron Champions and we’re excited to be the first to hit the marketplace in 2020, “said Alex Lewis, CEO of IMV. Over 1,300 gamers have purchased Gridiron Champions as pre-launch item since May 2017. While the game will soon be available to view through a featured demo/video, continued gamer pre-launch sales are offered through their website at imackulatevisiongaming.com. IMV has partnered with a top-tier investment core group to evolve the company structure and planning along with a top-down infrastructure including internal management, company growth plans including an IPO strategy and laying the groundwork for a combination of equity and debt, projected to exceed $10 million. 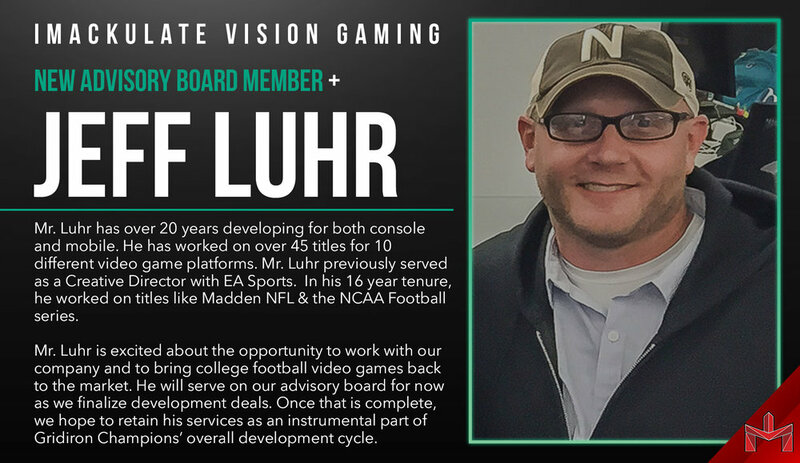 As they plan for their roll-out, IMV Gaming is working on next steps such as discussions with game developers in the manufacturing partner selection process as well as the future games for 2021 which include a potentially licensed version of Gridiron Champions and potentially a college basketball experience. After working for over two years towards the building the innovative and unique concepts of Gridiron Champions, IMV Gaming joins hands with professional athletes Oakland Raiders’ Vadal Alexander along with Brooklyn Nets’ Spencer Dinwiddie as early founding investors. Their excitement about the College Football gaming experience is growing like many since the longtime void in the marketplace hasn’t been filled. IMV has robust plans for the future and with that in mind, they are actively seeking sponsorships to bring another level of authenticity to its gamers. “Our current sponsorships and partnerships include, but are not limited to Xenith, Phenom Elite, Signing Day Recruiting, and Gridiron Football Helmets,” says Rusty Sugg, Chief Operations Officer. “We pride ourselves in maintaining a direct connection with our target audience.” IMV features the hashtag #BringBackGreatness across all of their social platforms. Nothing herein is intended to be an offer or solicitation of an offer for the sale or purchase of any security. References to names of persons and other companies or products should not be misconstrued as to the type of relationship with the Company, if any. Safe Harbor: This document contains certain forward-looking statements within the meaning of Section 27A of the Securities Act of 1933, as amended and Section 21E of the Securities Exchange Act of 1934, as amended, which are intended to be covered by the safe harbors created thereby. Investors are cautioned that all forward-looking statements involve risks and uncertainty, including without limitation, the ability of the Company to successfully implement its strategy, changes in costs of raw materials, labor, and employee benefits, as well as general market conditions, competition and pricing. Although the Company believes that the assumptions underlying the forward-looking statements contained herein are reasonable, any of the assumptions could be inaccurate, and therefore, there can be no assurance that the forward-looking statements included in will prove to be accurate. In light of the significant uncertainties inherent in the forward-looking statements included herein, the inclusion of such information should not be regarded as representation by the Company or any other person that the objectives and plans of the Company will be achieved. In assessing forward-looking statements included herein, readers are urged to carefully read those statements. When used, the words "estimate," "anticipate," "expect," "believe," and similar expressions are intended to be forward-looking statements.